Priory Sailing Club has a very impressive record for junior training and has introduced hundreds of young people to dinghy sailing and windsurfing. The organised training programmes, and the club resources made available to junior members, have encouraged many young sailors to become more independent, confident and resilient individuals, helped them gain qualifications enabling some of them to become instructors themselves, and started some on a journey that has led them to compete at the highest level. All this has been achieved through a partnership between the club’s instructors and coaches and the children’s parents. 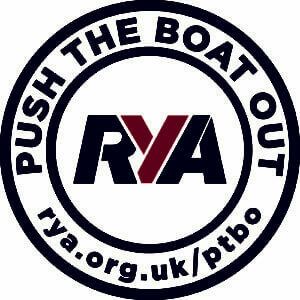 The club is an RYA Recognised Training Centre and holds RYA On Board, RYA Champion Club and RYA Team 15 status in recognition of the quality and quantity of our training programmes. All our junior training courses are run by volunteer instructors and are free to club members. Any young person can join the club as an Independent Junior member. For dates and times of the various courses please see our separate booking forms below. PSC’s junior dinghy training scheme is open to all children wishing to learn to sail. It gives young people the chance to try sailing in a safe, structured and fun environment. The starting point for novice sailors is the Beginner Pirates course. This four week course introduces the young sailors to the sport where they will learn how to rig their craft, steer their own boat to sail a simple course and return to shore safely. Taught in small groups this is the ideal way start sailing. Priory Sailing Club runs Oppie Beginner Pirates courses for the younger sailors (from age seven) using small boats especially designed for this age group (Oppies!) and also offers several Topper Beginner Pirates courses for the slightly older children using slightly bigger boats (Toppers!). On successful completion of the Beginners course young people can progress to the next level – the Advanced Pirates course. Consolidating their skills – Advanced Pirates courses. This four week course will develop their skills and their confidence, learning new techniques to enable them to sail more complex courses and making them more independent as sailors. They will learn about many aspects of the sport with safety and decision making key to their sailing development. On successful completion of the Advanced Beginners course young people can progress to the next level by joining the Buccaneer group. They may also be in a position to sail independently i.e. outside of the coached sessions, providing the conditions are suitable. This group meets every Sunday afternoon and caters for a wide range of abilities. Some sailors will have just completed the Advanced Pirates course whilst others may have sailed for some time. The experienced coaching team will provide training activities to develop everyone in the group. There are no booking forms required for Buccaneers, just turn up and get involved and become a regular sailor. Booking onto our Beginner Pirates and Advanced Pirate courses however is essential – please see our separate booking forms below. For further assistance regarding these courses, and to check availability, please telephone – Tony Ogborn on 01234 708010.